The picking is done entirely by hand, while the leaf is rolled into shape and dried with machines. The result is an economical early Spring green tea that is popular among frequent tea drinkers as a good quality “every-day” tea. Meng Ding Mao Feng’s aroma is like fried chestnuts over wild flowers. Chuancha No. 9, No. 13. Twelve-hundred years ago, the tea of Meng Ding Mountain in Sichuan and the Purple Bamboo Shoot (Gu Zhu Zi Sun) of Zhejiang became the earliest teas designated as tribute to the imperial palace. Due to difficulties in transportation at the time, Mt. Meng Ding’s tea was especially hard to come by in the common market. The literarti all went to great lengths to obtain this tea and each year composed numerous poems to describe the quality tea of Mt. Meng Ding. Water of the Yangtze River’s center. These lines of poetry suggest that in their time the best tea was considered to be that which was picked on top of Mt. Meng Ding and the best water was that which came from the Yang Zi (or Wade-Giles Romanization:Yangtze) River. It’s evident in this passage that the tea connoisseurs of antiquity were already insisting that good tea should also be paired with good water. Mt. Meng Ding’s tea is picked earlier than other places. The picking of Meng Ding Sweet Dew (Gan Lu) begins as early as late February while Meng Ding Mao Feng is picked in the middle of March. The picking is done entirely by hand, while the leaf is rolled into shape and dried with machines. The result is an economical early Spring green tea that is popular among frequent tea drinkers as a good quality “every-day” tea. Meng Ding Mao Feng’s aroma is like fried chestnuts paired with wild flowers. 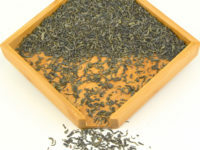 It possesses the classic characteristics of teas grown in Sichuan– persistent aroma, rich mouth-feel without bitterness, and a slow infusion. Infusion: First infusion at least 1 minute. The leaves are good for 4 infusions. Add a little more time for each subsequent infusion.